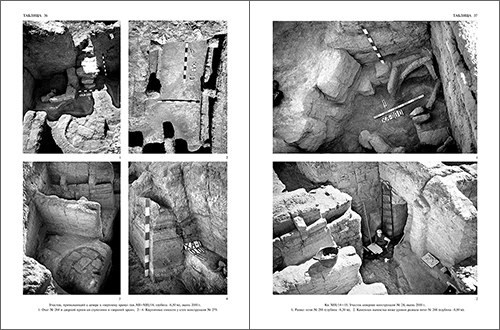 The book presents the report of excavations carried out by the Russian archaeological mission in northeastern Syria from 1988 to 2000. The excavations were conducted at Hazna tell, 17 m high and 150 m in diameter. Up to present time the area of more than 2000 sq. m has been excavated and unearth settlement was identified as religious and administrative center of local surroundings. The settlement functioned a short period of time — from the end of the IVth till the middle of the IIId mil. BC and then was abandoned by its inhabitants. The constructions of the settlement were found in a surprisingly good state of preservation. Most of them are dated to the first half of III mil. BC. and were not disturbed by later cultural layers. Some of the constructions walls were preserved to their original height. 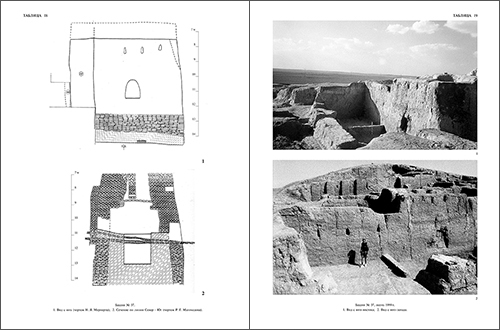 The Part I of the book describes the main features of the Tell Hazna complex, which are typical for early temple architecture. The constructions of the complex were built on several (at least free) oval terraced platforms raised one above another. Some of the buildings were decorated with pilasters and niches between them and bore traces of color plaster. Only few areas of the complex could be defined as dwellings, while the majority of the constructions obviously were used for ritual and economic purposes. Special attention is given to the description of certain sectors of the complex. The most monumental construction of the complex is Tower 37 built on the low terrace and called «Low Temple». It preserved to a height of 8 meters and underneath had 1 m high socle. Beneath the socle a sacrifice offering of three ungulates was found. Another offering consisted of stone seal and flint blades was found in the upper part of south wall. Undoubtedly these offerings were made as part of special rituals at the beginning and at the completion of the construction of the Tower. This Tower, with adjoining courtyard and two chambers at both sides of it are identified by the authors as temple complex. A brick pedestal unearthed in one of the chambers appears to be a sacrificial table. A stone paved path, which was traced from low levels through Tower 37 to constructions on tell’s top, was probably a «procession road» at early stages of the existence of the complex. The inner arrangement and the size suggest that this Tower, as well as Tower 110, were also used as granary similar to granaries depicted on cylindrical seals from various Mesopotamian sites. The Part II is devoted to the morphological and statistical analysis of ceramics found at the site. 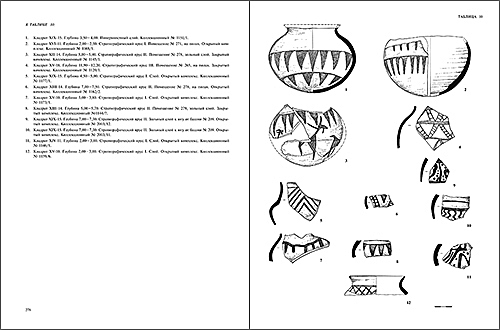 The distribution of different types of ceramics allows the author to synchronize Tell Hazna materials with the comparable data from other excavated sites of Djezira region, such as Tell Brak, Tell Leilan, Chagar Bazar, etc., and to date the existence of the Tell Hazna I settlement from the Early Uruk (or Ubaid–Uruk transitional Period) to the end of the ED I Period. The Part ends with the graphical catalog of Tell Hazna ceramics. 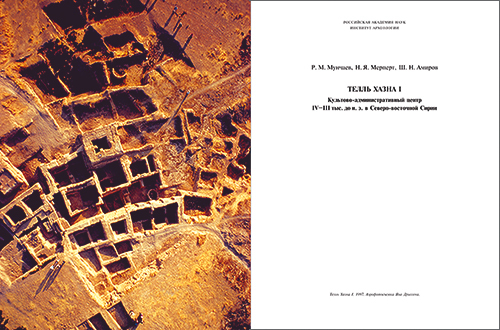 The Part III describes the burials of Tell Hazna I, which probably were made right after or, at least, shortly after the complex had been deserted. The construction of burials and the finds from them enable the author to date the burials to the XXVI–XXIV centuries BC. 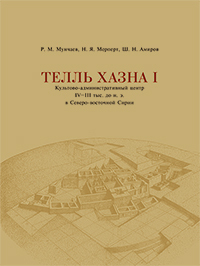 The history of Russian excavations in Mesopotamia is presented in the Supplement, followed by a complete bibliography of works published by the members of the Mission. 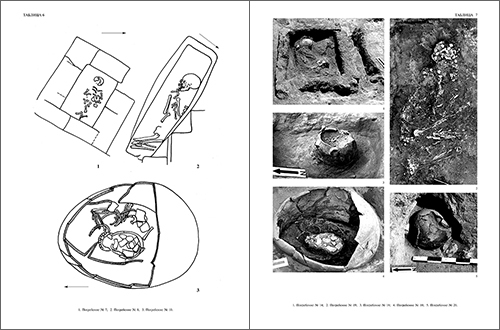 Special chapter of the Supplement is devoted to pottery kiln found in a south-west sector of the tell. 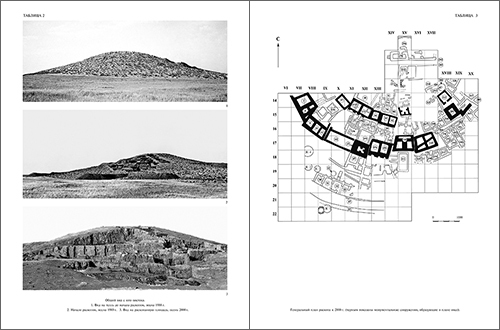 The author provides a detailed description of kiln construction and discusses typology and evolution of near-eastern kilns. Separate chapters present the results of palaeoethnobotanical, palynological and archaeozoological analysis of data collected in the course of excavation. Fronticepiece (Tell Hazna I, 1997) and Page 1. Plate 2. General view of Tell Hazna I from the southwest. 1. Before the excavations, spring 1988; 2. Start of excavations, spring 1989; 3. Excavated area as of autumn 2002. Plate 3. General plan of excavated area (the outer oval of monumental constructions depicted in black). Plate 18. Tower No. 37. 1. View from the south. 2. Section on the N–S line. Plate 19. View of tower No. 37, autumn 1999. 1. View from the southeast; 2. View from the southwest. Plate 36. Squares XII–XIII/14. Area adjacent to ‘Upper Temple’ from the north at the level of -6.50 m, autumn 2000. 1. Furnace No. 284 and stepped doorway to ‘Upper Temple;’ 2–4. Brick containers inside structure No. 279. Plate 37. Squares XIII/14–15. Area to the north from structure No. 24, autumn 2000. 1. Debris of the furnace No. 288, level -8.30 m. 2. Stone pavement below furnace No. 284. Catalogue of Ceramics. Plate 10. Burial Complexes. Plate 6. 1. Grave No. 7; 2. Grave No. 8; 3. Grave No. 10. Plate 7. 1. Grave No. 14; 2. Grave No. 19; 3. Grave No. 18; 4. Grave No. 10; 5. Grave No. 20. English summaries and legends (p. 475–486).